Full-sized non-luxury cars have suddenly become amazing. MPG: 21 city/31 hwy, with 4 cyl. Almost all at once, it seems, full-sized non-luxury cars have become amazing. Consumer Reports just came out with its "Holy cow!" assessment of the new Chevrolet Impala, a car that was, just a few months ago, safely ignorable. Now it's a serious competitor to luxury cars costing tens of thousands more. 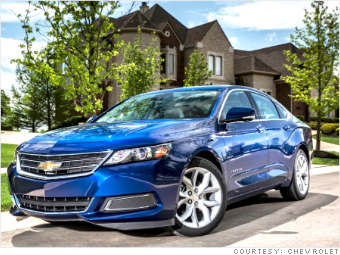 Our own assessment of the Impala was right in line with Consumer Reports, and many others. The Impala is nicely designed, the interior is handsome and functional. Like a luxury car, the Impala rides smoothly and quietly while delivering competent handling. The Impala offers a four-cylinder engine option for greater fuel economy. (We tested it with the V6.) No other car in this gallery offers a four cylinder option, but to be fair, some match the Impala's fuel economy with their V6 engines. All of this vehicular greatness just shows the benefit of competition. Take a look at what the Impala's up against and you'll understand why General Motors (GM)' designers and engineers had to go all out to have a shot at the top.